I know a lot of you are curious about the air quality in the Redding area. Although it is still smokey, conditions have gradually improved this week. Today is the first day in weeks that I would say it is sunny and hot. I have a feeling the skies will remain smokey for quite some time given all the fires we are experiencing across the state. Redding (and Shasta County) is still reeling from the devastation brought on by the Carr Fire. 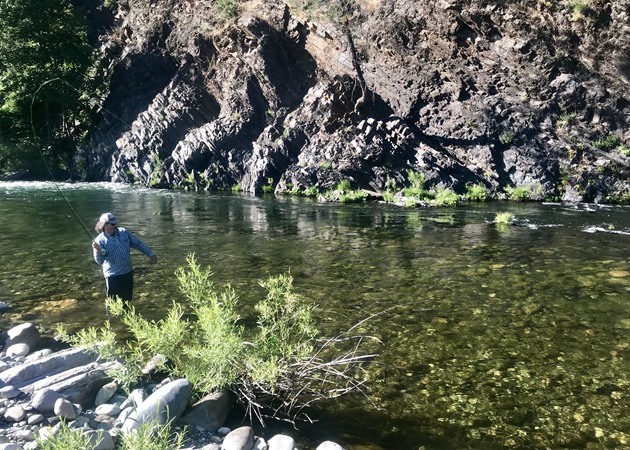 As a result, the much anticipated re-opener of the upper river didn’t happen for a lot of us. I rescheduled all my trips due to the dangerous air quality. I am happy to say, I will be back on the Sac starting this Sunday and Monday! I will post fishing reports to let you all know have the river is fishing. Tight lines! The hex hatch was outstanding the last few nights. My clients Jim and Corey landed several fish over 20 inches and had a bunch of other eats. Daytime fishing has been really good. There are some very large fish eating drys in the morning, very technical game but extremely fun head hunting. Sinking lines are also working very well late morning to early afternoons. Then it gets agonizingly hot and the fishing shuts down. I had a great time with dusty and Darrell today. Both are brand new to fly fishing and today was their first time indicator nymphing. The morning started off slow, but they were getting some inconsistent grabs. The action picked up after lunch as their skills improved. Darrell was not able to land any fish, but Dusty landed two, including a very fat 17 incher! 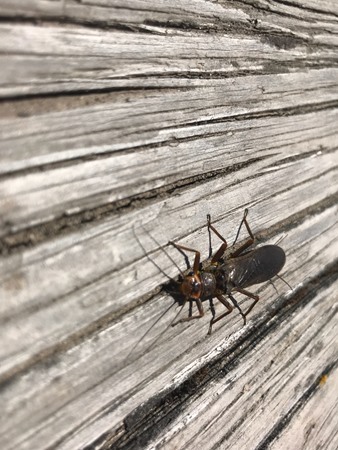 They will be venturing to the upper Sac tomorrow, so I provided them with lots of information on flies and rigging so they are able to have a successful day on their own. Fall River fished awesome last weekend. Friday morning there was overcast, so the dry fly fishing was absolutely superb with big fish looking up. 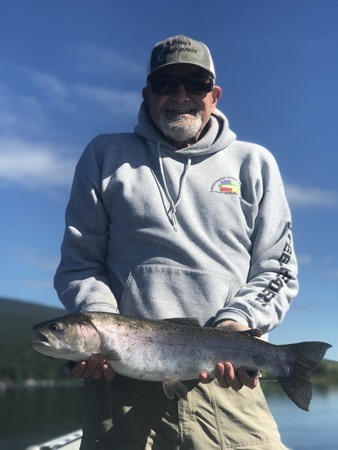 No dry fly action on Saturday, but my rock star clients Dennis and Tony from the Bay Area absolutely pillaged on sinking lines between 10-1pm, hooking around 30 fish between 13-20 inches. The hex hatch is still going strong. 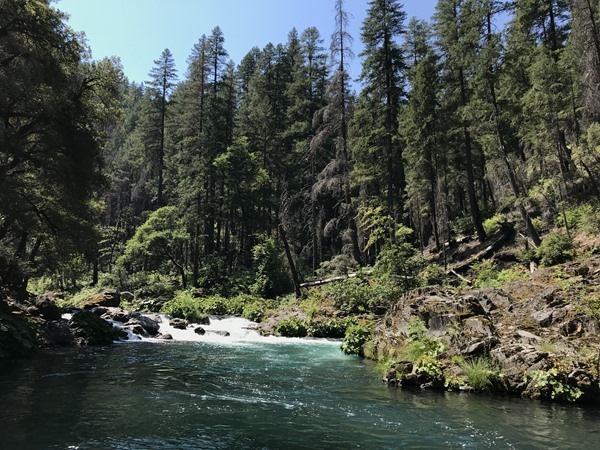 I’ll be back down to the beautiful Fall River Valley next weekend and have a few open days left before I start swinging for steelhead on the upper Rogue soon. 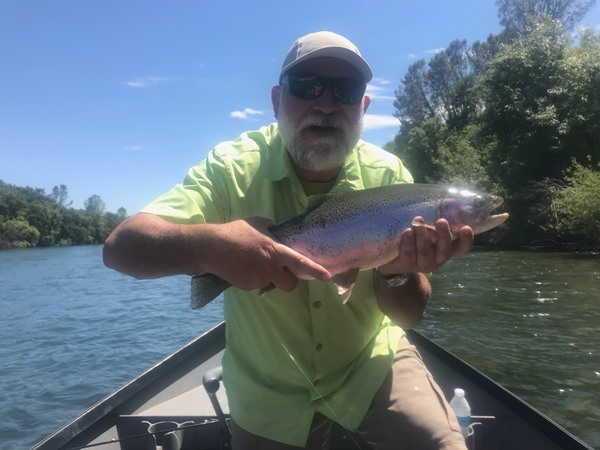 How can you come fishing the north state without floating the Lower Sac? The morning was slow, which seems to be the new norm. After lunch Vik hooked into three fish in less than five minutes. The afternoon was a little spotty; we would get several hook-ups in one spot, then nothing. By the end of the day, the total number of hook-ups made for a solid day. 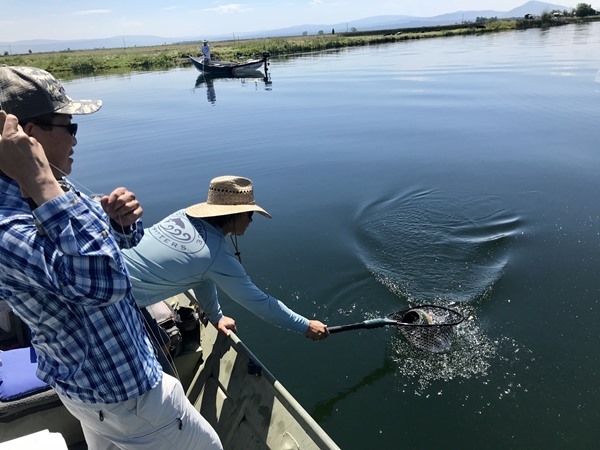 The Klamath Basin is reaching it’s peak of summer fly fishing. Large Redband have made there way into the Williamson River. Most fish are being picked up on small leeches and soft hackles swung on intermediate lines. Long leader and 5x are needed at this time of year. Pelican Bay/Rocky Point is fishing really well. 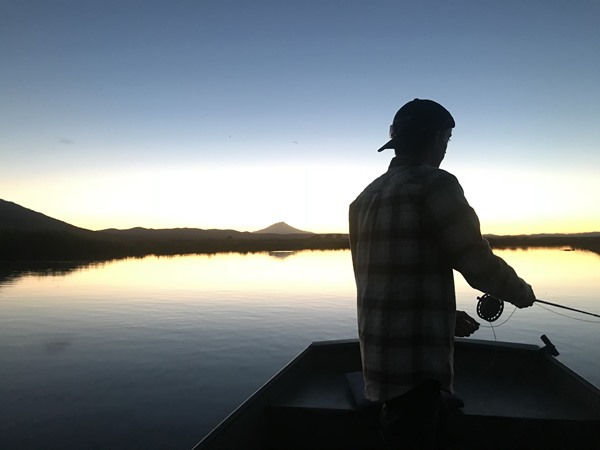 Chase the wind and fish early and late in the springs. Small leaches, damsels and balanced leeches have been fishing well in the Bay. 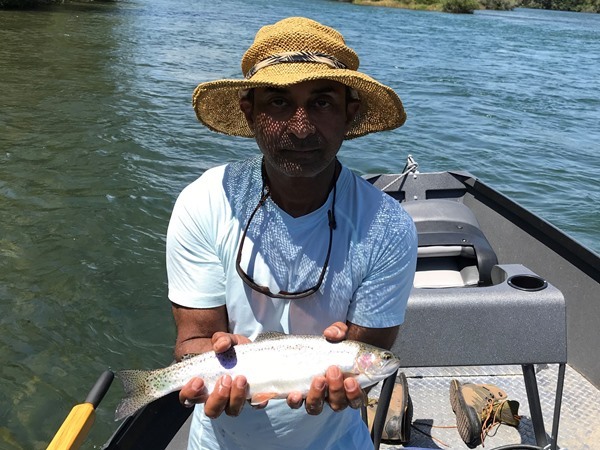 We still have a few prime dates in August for the Williamson River, Wood River and Pelican Bay. I had the pleasure of guiding Vik on the McCloud today. 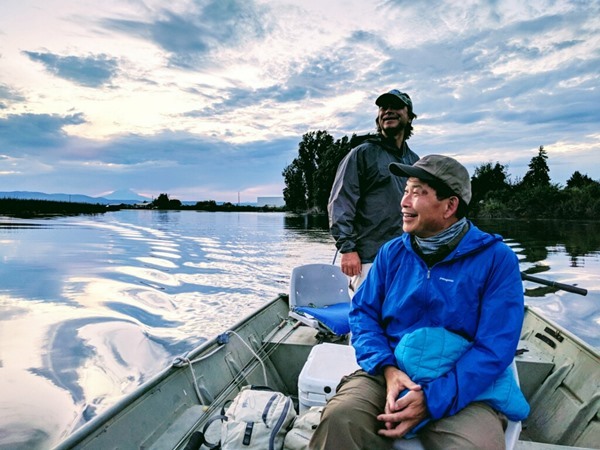 He traveled from southern California hoping to discover some of the fisheries in the north state. The temps were extremely hot, so it was a relief to get in the water. Our morning was pretty slow, but things really picked up after lunch. We were hoping to have a chance to fish dries, but see didn’t see any fish rising. It’s always a great experience fishing the Mac! Fall River is fishing very well from around 10am-2-30pm or so. 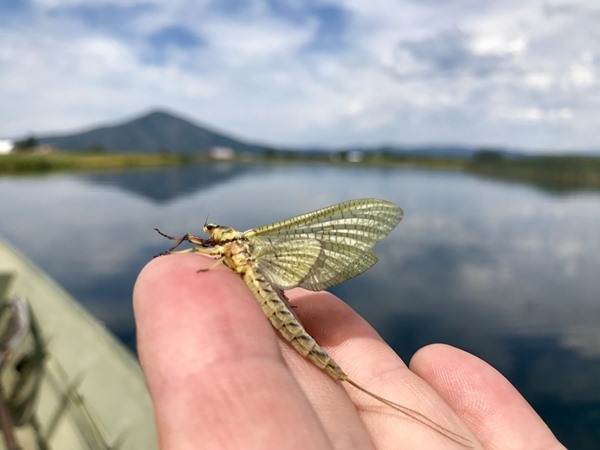 The streamer grab has been consistent with damsels and water boatmen getting very active as the day heats up. Swinging soft hackles has been super productive too. 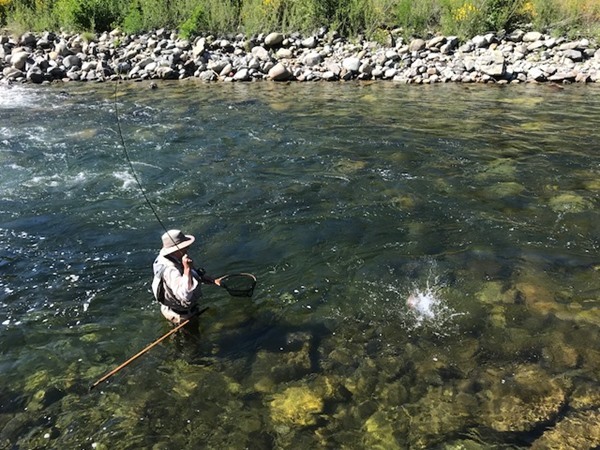 There is some sporadically decent dry fly action if you have the patience and casting skills to get it done, but the bigger fish haven’t been looking for them the past few days. It should get better in these next few weeks as hatches should get going more on the lower river. The hex hatch has been a little hit and miss over the past 5 nights, but the fish on the lower river are still looking for them regardless. Williamson RiverThe Williamson is Fishing well right now. Hex’s have not come in great number yet. Next week the Basin will have a little heat wave that will move more fish up river and should be the peak of the Hex hatch. 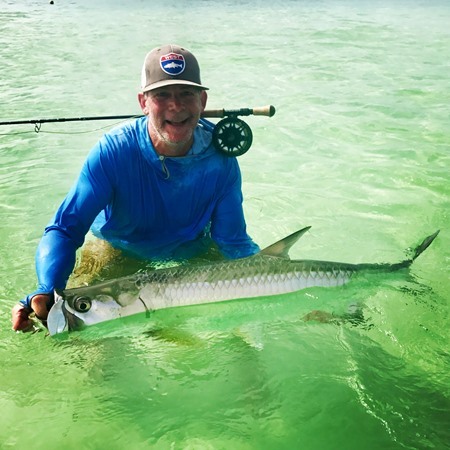 Most fish are coming on intermediate lines swinging small leeches.Pelican BayThe fish are in at Pelican Bay! We are getting fish good fish on balanced leeches and small seal buggers. Fish early and late in the day for your best action. 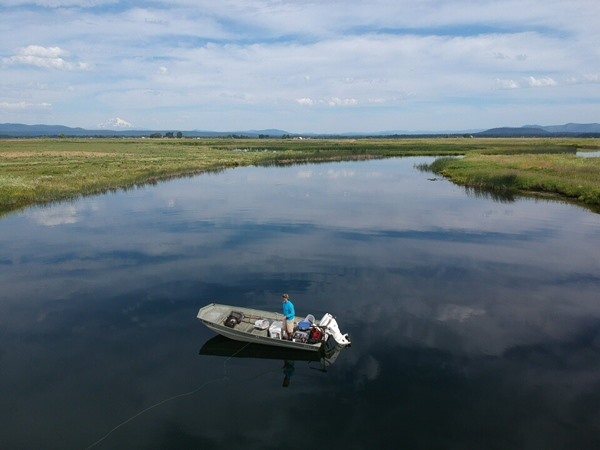 Fishing is picking up in the Klamath Basin. The The first big batch of lake Redband has moved into the Williamson, coinciding perfecting with the start of the hex hatch. The peak of this hatch will come in the next two weeks. Best success has come on leeches and soft hackles swung on intermediate full sink line. 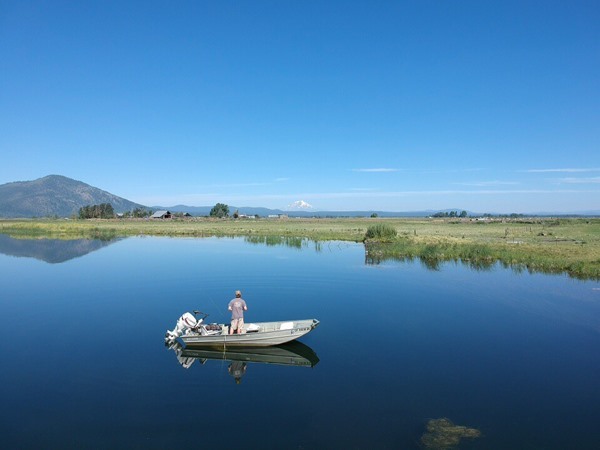 We fished Pelican Bay twice this week and the fish are staking up in the springs. Again, our greatest success has come on leeches and softhackles. A few fish were landed with balanced leeches. This fishery will only get better in the next two months. This is only only the start for the Basin. 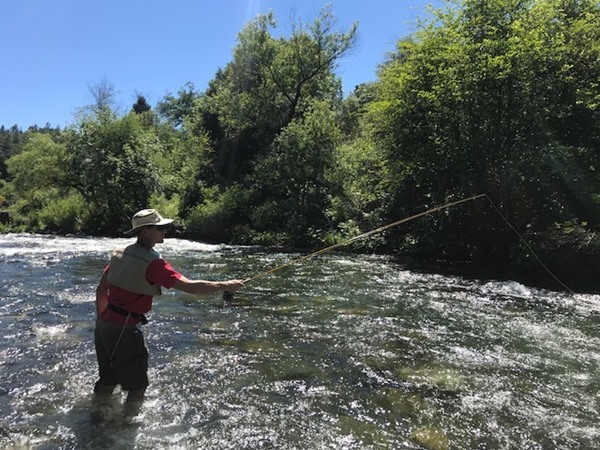 As the weather warms more fish will move into the Williamson River, Wood River and Pelican Bay. I had the pleasure of guiding Patrick and Mike on a Trout Spey trip today. Patrick is an experienced two-handed caster, but Mike is new to spey casting. I spent most of my time with Mike, who was able to make some very nice casts by the end of the day. After offering a few minor suggestions to Patrick, he had an “aha” moment and started bombing his casts! Both got grabbed, but Patrick had a really good day hooking and landing several really nice trout! Wading the river felt really good on a hot day. Lower Sac: Jun 19, 2018, by Tyler: Lot o' Fun! 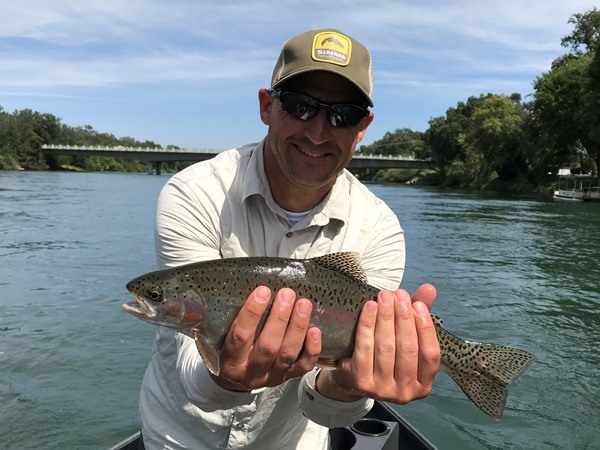 Mark and I had a lot of fun fishing the lower Sac these last two days. 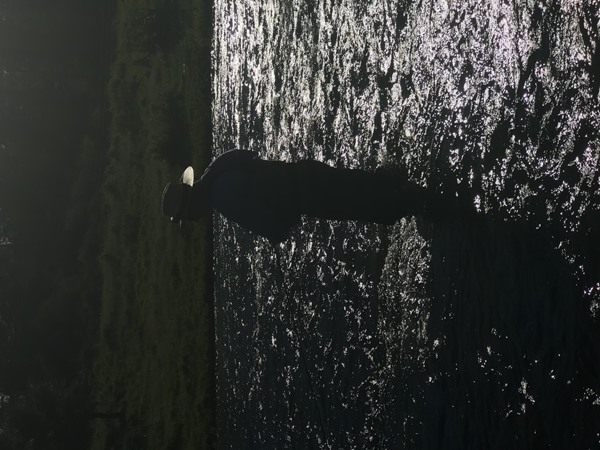 On Father's Day, Mark and I fished the lower river to avoid the crowds. We caught several nice trout between 12 and 16" with the river to ourselves. In the evening, we threw the spey rod in the Barge Hole. 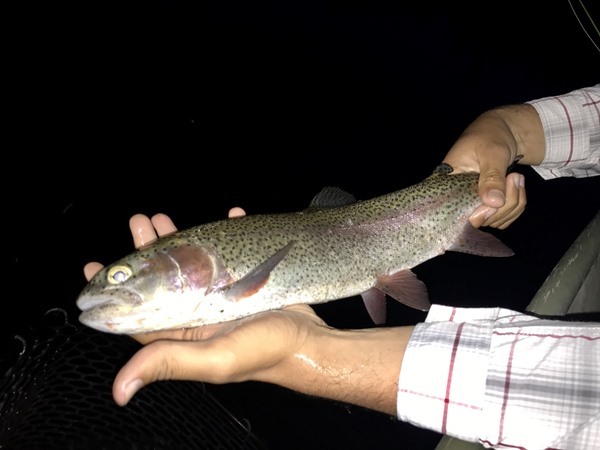 On Monday, Mark and I fished the top section in Redding and hammered on some big Rainbows. Mark landed two fish over 20", with one being around 24". We also fought and lost several other beautiful Rainbows in this size range. The weather right now is perfect in Northern California. It's making for some great days on the river! 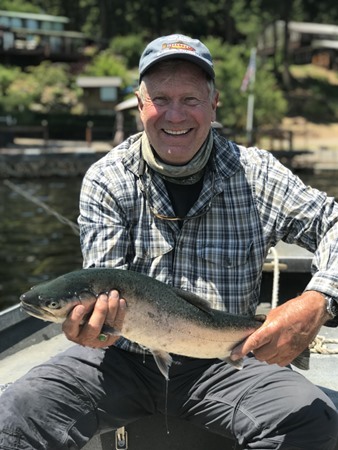 Thank you, Mark, for two fun days of fishing the Sac! I had the pleasure of introducing Ray and Silvia to fly fishing today. The fishing was pretty slow for us today. There were a few other boats on the same float and it seemed everyone was struggling – which can happen every once in a while. The flows were bumped up to 10,250 cfs yesterday, and scheduled to rise to 10,500 cfs tonight. The weather has been fairly reasonable as far as heat, but it is always much cooler on the water! I had the pleasure of introducing Ray and Tasha to fly fishing. Ray had very little fishing experience and this was Tasha’s very first time! They picked-up the casting right away, but struggled with strike recognition and setting the hook. Tasha seemed to get more action in the front of the boat, but Ray was able to land his first fish within the first hour! Ray managed to land two nice wild fish and Tasha had one on for a few minutes, but lost it right next to the boat. The grab was a bit slow, but fairly consistent until the wind really set in, and then the bite really turned off. They had a great time and are already talking about buying their own equipment! I just opened up my Calendar to do some Nor Cal trips in July. I will be crashng on Fall River for a few weeks, fishing the famed Hex Hatch for my 17th season. It just doesnt ever lose its intrigue or excitement for me. 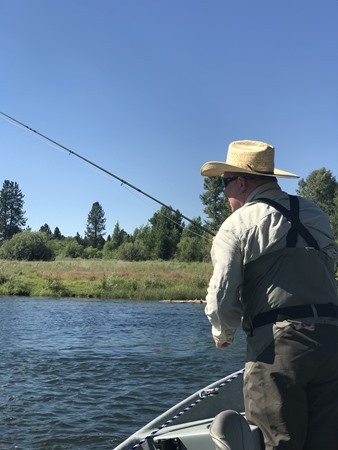 I like to do split days during that time of year, where we fish the Fall, McCloud, Pit, or Hat from the morning into the afternoon, then take a break during the heat of the day and head back out for the Hex in the evening. My boat is parked on the lower river right where the prime water for the hatch happens. 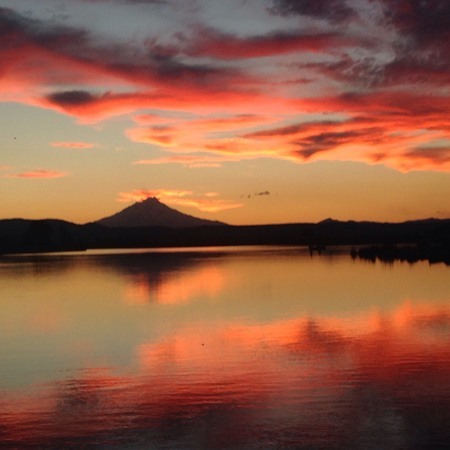 Just show up, jump into the boat and get ready for the epic sunset view of Mt. Shasta and the biggest mayflies in the world getting chomped by big wild fish. With the hex already popping on the lower river, this is looking like it will be another epic season for it. Check my calendar for the few open days that I have left. The Williamson River is in perfect condition. Water is low and clear for this time of year. There are prolific hatches of Golden Stones, Yellow Sallies and several species of Mayflies. The majority of the large redband have not showed up from the lake, however I would expect this to happen earlier this year as the lake warms. We have had a lot of success with fish between 12-20" nymphing and swinging leeches in the riffles. This fishery is just beginning. 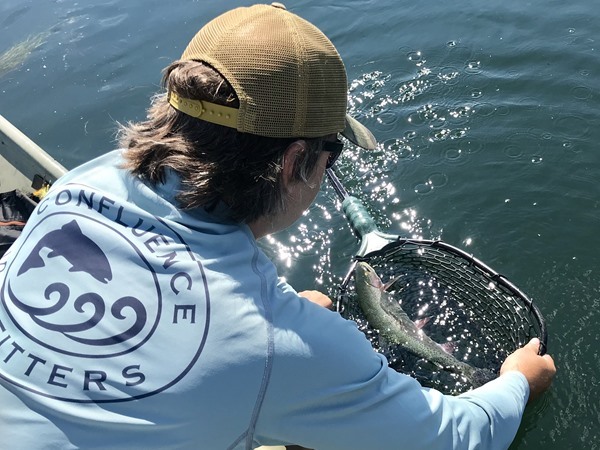 As the weather gets hotter, more fish move into the Williamson and fishing will only get better. Try nymphing golden stones and wired golden stones to imitate the Yellow Sallies in the Nymph stage. Your standard mayfly nymphs in size16 (princes, copper johns and pheasant tails) will work trailed behind a size 10 Golden Stone. When Swinging, we typcially use intermediate lines with brown and black leeches size 8-10's. Guided Marissa and Jon on the Upper + Lower Sac last couple days. 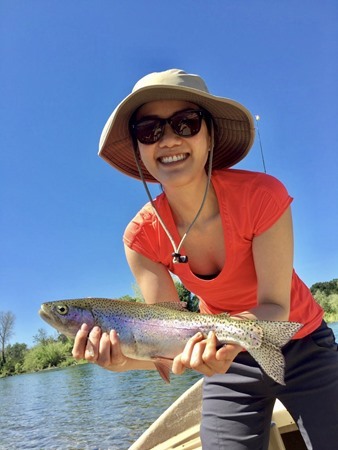 It got pretty warm this weekend, but that didn't stop us from finding a few rainbows. On the LS we fished the side channels and found several fish in little slots + pockets. Golden stones + copper Johns (red/copper) + solitude stones worked for us. 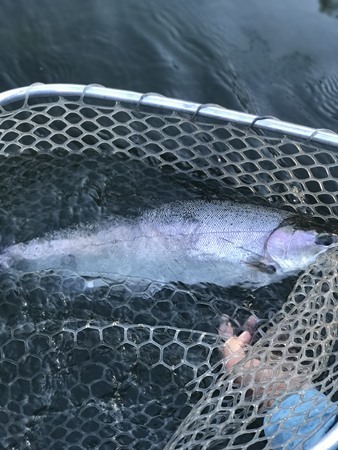 The flows dropped some 500 cfs in the last week and the fish seem to dig it. Marissa posing w her first rainbow trout! I took buddies Ron and John out on the Upper Sac today. We did a noon-to-dark trip so we could fish the evening hatch. It was a good call! Nymphing was pretty good during the day and we had quite a bit of surface action during the evening hatch. The hatch was a mix of caddis, little yellow sallies, and mayflies. We didn't see golden stones, but got quite a few grabs on big dries nonetheless. The big fish of the day was a brown trout about 18" that ate a big dry fly at dusk. Wet-wading was very comfortable during the heat of the day but we switched to waders for the evening hatch. We lucked out today and had two great sections of the river all to ourselves. 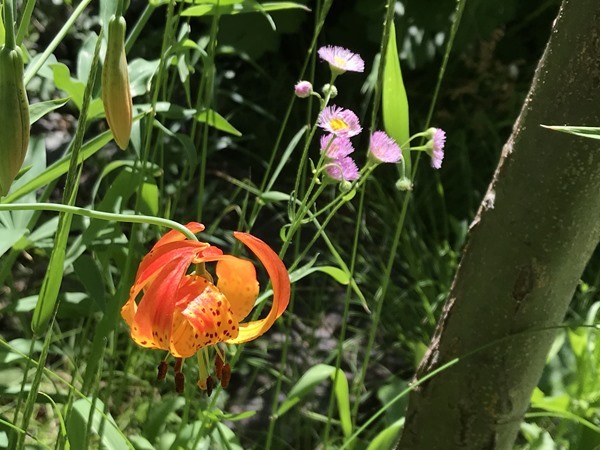 Upper Sac: Jun 2, 2018, by Sam: Upper Sac is happening! 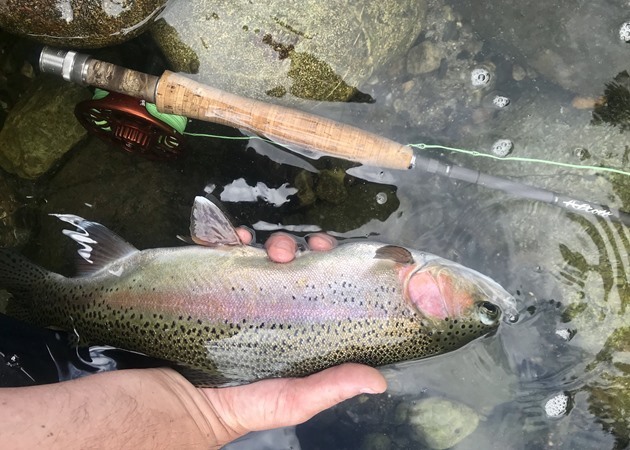 Spent several days this week on the Upper Sac fishing various techniques. Stone flies are hatching everywhere. It's not too hard to figure out what's on the menu for these fish- keep it simple! Nymphing/high-sticking is by far the most productive method to getting hookups. Swinging/stripping a sinktip line through the deep pools has been working too. The evening "magic hour" can come+go pretty quick so have a dry fly rod ready to fish- rigged and ginked! 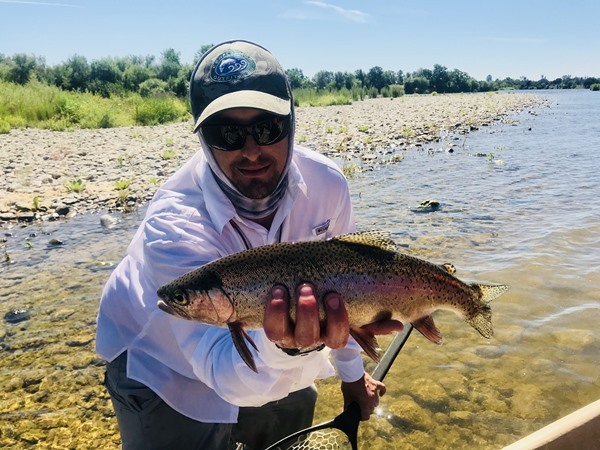 Upper Sac rainbows fight hard!